Small. Simple. Effective. The business card is a popular and useful marketing tool and has been around for a long time, in one form or another. Let’s take a look at this essential piece of business stationery. The origin of the business cards takes us back several centuries to China. In the 1400s, traders and wealthy businessmen used these early cards to request a meeting or “visit” with other individuals. These cards were an early tool of self-promotion, allowing the bearer to describe their credentials to potential clients. Servants often collected these cards from prospective visitors and they would be reviewed by businessmen to decide with whom to meet. By the middle of the 17th century, the practice spread to Europe, and visiting cards were employed by the European elite. The size of modern playing cards, they were engraved, embossed and often included gold elements and were used for a variety of social interactions — from business meetings to dating. During this time, street numbering was not standardized and businesses were often hard to locate. Enterprising entrepreneurs solved this problem with trade cards, which were typically printed on both sides. One side contained information about the business; the other side featured a map or directions to the location. Visiting cards and trade cards were popular through the 18th and 19th centuries, although each had its own special etiquette. Printing methods improved during this time and made publishing newspapers and periodicals more practical. Ironically, this improved technology was partially responsible for the downfall of the trade card industry. Advertising in newspapers and other periodicals became more affordable and largely replaced the need for trade cards. Popular in both Europe and America during the 19th century, visiting cards or calling cards were an essential accessory for middle-class ladies and gentleman. Initially, simple cards used to announce a person’s arrival, calling cards soon became more elaborate and decorative as Victorians took advantage of new printing technologies and a “more is better” aesthetic. There was specific etiquette for calling cards, and violating these rules was a definite social faux pas. Calling cards were often displayed in silver trays in Victorian homes to advertise one’s extended social circle (think of it as 19th-century social media). Business cards were also used during this time and were kept separate from calling cards. In fact, using a business card for a personal visit was a social no-no. Calling cards were generally used by the manners-conscious affluent. With the rise of the middle class and the lessening of social formality, visiting cards and trade cards eventually merged into something similar to our modern-day business card. More efficient modern printing methods also helped hasten this change, as the business card became a must-have item in both the United States and Europe. 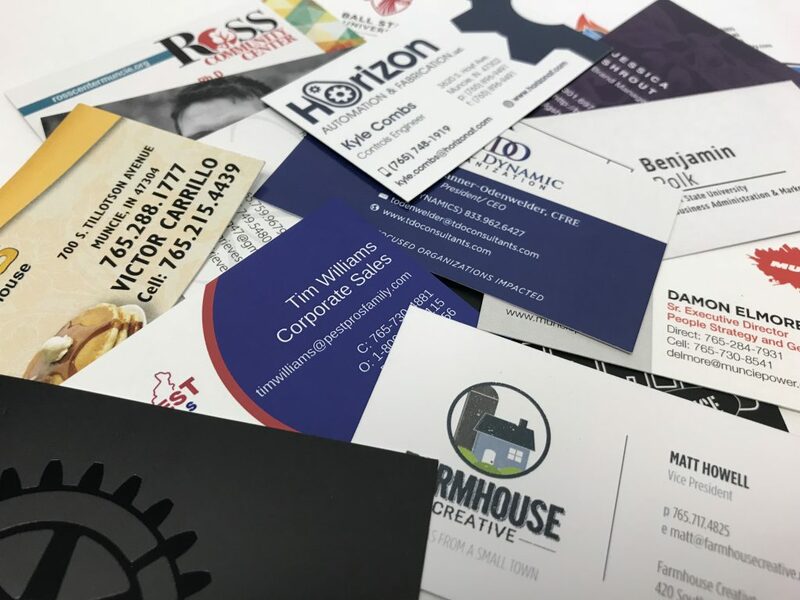 By the 20th century, the business card we know today became the established norm for corporate executives and small business owners alike and a cost-effective marketing tool. Featuring black ink on white cardstock, the classic business card measures 3.5” x 2” and fits neatly into a wallet or card case. Changing printing technology has made color an affordable option for cards and allows for greater creativity. Cards today can be printed on a variety of surfaces including plastic, wood, and metal. A unique card design on a unique material can get you and your business noticed in a crowded landscape. In today’s digital age, some may see them as old-fashioned, but like other forms of traditional marketing — brochures, flyers, billboards, and print ads — business cards still deliver. And, in a throwback to an earlier time (we’re talking the 19th century), people have different cards for different purposes: the standard business card for their main job, an additional card for a side project or volunteer role, and a personal card. In a world filled with texting, emailing and social media, handing someone a card is a quick and easy way to make contact and make an impression. Need help with your business cards? Farmhouse Creative is here for you.